A long time back I left the Charleston airport in a private plane headed for Bimini in the Bahama Islands. It was going to be a fairly long day, so I settled into the back seat and asked if we could fly at a lower than usual altitude. Yep, I’m one of those pilots and one of those passengers. I like to see the coastline. After refueling in Ft. Lauderdale and heading out across the water, we landed on a strip that jutted out into the Atlantic on South Bimini Island. We were met by Bahamian customs agents, and then put on a taxi through crystal clear water to the larger island hotel where Ernest Hemingway lived while writing Islands in the Stream. The hotel was rustic, and I could see why a man like I think Hemingway would have been, could have made himself at home there. In my imagination, I could see Hemingway having a shot of whiskey while sitting at the desk or in the overstuffed leather chair, in this dimly lit room, while his literary mind gained control of his thoughts and his pen scribbled them on paper for another remarkable book. Only the thought of good food pulled me away from the den of a great writer, but being hungry, I was off to find good bread and good Bahamian fish and langoustines. Not far away I found a restaurant on the water with a cool, shaded opening in the wall from where I could see the Bahamian gunboats cruising past the coastline with armed sailors, as well as the boatloads of their fresh catch coming in to the harbor. I ordered fish for lunch and it was fresh caught and delicious. I can’t remember what kind it was, but I do remember that it was good, just like everything else I ate while I was there. I loved the food and the character of the place. When I think of good fish, I think of the wonderful meal that I had while sitting near the water in Bimini. 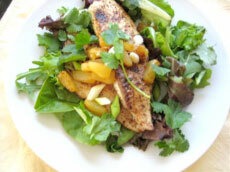 And, that made me think that I’d like to share two fish recipes that are light and low in calories. Both are easy to make and the best part is that you can eat them with fall lettuces from your garden. Preheat oven to 350º. In a small saucepan or skillet over medium heat, place vinegar, shallots, and garlic and cook until soft or until white wine vinegar has evaporated (3-4 minutes). Set aside. In a pot of simmering water, quickly blanch enough Boston or Romaine lettuce leaves to wrap the fish. Drain well. Prepare a baking dish or heavy ovenproof skillet by adding a tablespoon of olive oil to cover the bottom. Set aside. Rub each fillet of fish with olive oil, and sprinkle with thyme, tarragon, salt and pepper. Spread each fillet with the shallot mixture. Starting with the small end of each fillet, roll it around the shallot spread and place the roll on top of a lettuce leaf. Fold lettuce around fish and place packet seam side down in the baking dish. Brush packets with olive oil. Cover the baking dish tightly with foil and bake for 25-30 minutes depending on the size of the fish. Serves 4. Note: I used Romaine leaves with the heavy bottom ribs removed. Preheat oven to 350º. Cover a baking dish with foil. Place the fish on the baking dish and brush both sides of each fillet with olive oil. Sprinkle the fillets on both sides liberally with Cajun or blackening seasoning, or to taste. Sprinkle the top side of the fish very lightly with cinnamon. Bake for 20-25 minutes or until fish is firm. To caramelize the pineapple, add one tablespoon olive oil to skillet on medium high heat and cook until lightly brown. To serve: Place baby greens on a serving plate. Add one fillet and top with 1/4 of the pineapple, 1/4 of the onions, and 2 tablespoons cilantro leaves. Squeeze lime juice over the top of the salad, or use your favorite dressing. Repeat process until remaining salads are made. Serve warm. Serves 4.